Kromaia is a game I got thanks to the big Toys R Us sale. Otherwise I don’t think I ever would have gotten to play it so this worked out well. It’s a pretty fun shooter game. The title is a little short and won’t be revolutionizing the genre, but it’s a very unique game and one that you will enjoy. Even as I type this I am tempted to go back and complete the other levels again so I can unlock the true ending. Perhaps at some point I’ll get on that. If this game ever gets a big sequel I’ll be on the lookout for that. The game starts off with a little lore. I’m not sure I got the correct meaning from it, but what I understood is that there are 4 gods which rule this universe. They seem to have wiped out humanity in the process, but we are able to put a soul into our last spaceship. This spaceship must now go into each of the 4 corners of the universe and wipe out the deities. Fortunately as each one is content with their victory they have no way to communicate with each other so you can take them all out. If you destroy them all then you can get the key to the universe! Each level starts off with a little message about this and your A.I. will warn you when the bosses show up. It’s a pretty fun story and the mystery angle is handled quite well. I think the story is what helps bump the game to the next level. Without it the gameplay would still be fun but the story always adds a little something extra. There are 4 levels in the game. The first part is about getting through 20 rings. Doing so will summon the boss for the big end of level fight. Each boss is unique in how you will handle them. The first one is about taking down all of the weak points while the 4th one must be overheated so you can reach them. They’re all unique and this game follows the correct standard of not reusing bosses. Each world has a unique armor and once you’ve beaten all of them the first time you can use whichever one you want for each level. Plus if you want to unlock the final level you’ll need to beat all 4 levels with all 4 armors. It adds a little replay value and the game is just short enough where this doesn’t feel like a big grind. I do think the bosses seemed to get harder when I went back to beat them again, but maybe that’s my imagination. I only went back to the first boss to beat it the additional times so far. My favorite armor is probably the sword one. You’d think that having a close quarters combat mech in a bullet hell game would be a bad idea, but it’s really op. Pretty much any opponent will go down in a single swing to that armor. That’s how good it is. To go a little more in depth on the gameplay, it’s 3D as I mentioned. Each armor has 2 weapons, the main attack and a charged one. Typically you’ll be focusing on the main weapon, but I recommend using the charge as soon as it’s ready. You also have a boost option which will boost in the direction you are moving in so sometimes you can use it as a full retreat option or to go towards the boss if you wish. The controls are pretty smooth once you get the hang of it. Focus on mastering each armor and you’ll be unbeatable. My least favorite was probably the green one. It’s not bad, but it felt like the weakest option. The graphics are quite solid. There’s always a lot happening on screen and the game has a ton of character models so you can see how much heart was put into it. The level designs are really fun. You feel like you’re in another version of outer space as everything is futuristic. I also thought the soundtrack was good although it can be a little hard to hear among the constant blasting. In particular the green armor is very loud with his attacks. Kromaia went above expectations for sure. Especially as my initial impression on it wasn’t great as I first played the level earlier in the year and died. I remember putting the game down at that point and only just got back to it. The game can be a little vague on where you have to go and how to get there, but once you get used to the compass you’ll be set for the rest of the game. There is a level up system here. I made it to level 12 but it’s hard to tell when you’re getting exp or not so I didn’t actually fight too many enemies. I’d just fly over to the boss. Apparently there are 100 levels though and I imagine that you will be incredibly powerful by that point. It helps add to the replay value. While the campaign is quite short it should still take you quite a while to reach the Platinum trophy. I got the game for around 5 or less with the 75% off at Toys R Us but 20 wouldn’t be bad. If you have to spend 30 or more then I would think twice about it. Take a look at the gameplay videos and see how it looks to you. Overall, Kromaia was quite a bit of fun. It was more enjoyable than I thought it would be and while some games tend to be less enjoyable in hindsight it is quite the opposite for this title. 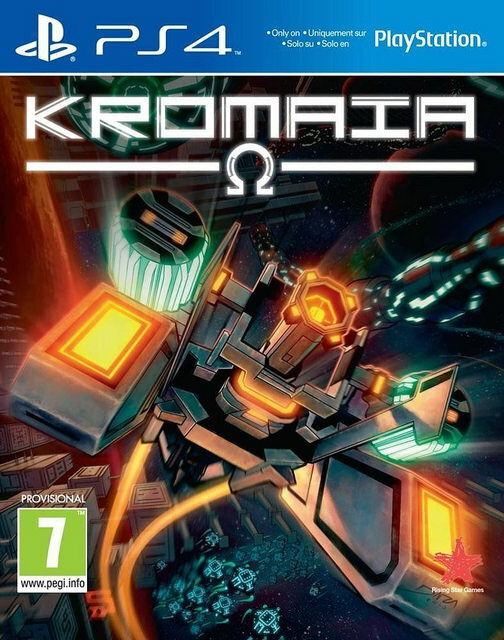 There aren’t too many big 3D bullet hell games right now so if you have yet to check this genre out then Kromaia is a great way to start off. It can be a little challenging but never unfair. There are also frequent check points so you’ll eventually make it through. If any section seems impossible then try going at it with a different approach. The bosses can be deceptive but they can all be soundly defeated with the right strategy. This entry was posted in 6 Star Games, Game Reviews, Games, Reviews and tagged Game Review, Kromaia Omega, PS4, Review, Sci-Fi, Shooter, Sony, Video Game Review by dreager1. Bookmark the permalink. Never heard of this game. It sounds fun. Didn’t expect a shooter to have much in the way of story. Melee attacks in a spaceship game is a bit odd, but it worked in Outlaw Star. True, shooters typically focus on the gameplay. I haven’t seen Outlaw Star, but I imagine it would probably be similar to this. In Kromaia it’s like the ship has a giant sword built into it and you swing it around as if it was a window washer. It just pops out and slices away whole ships. It’s pretty awesome, then you can also shoot out shruikens to far away targets.